This article written by Charles Lewton-Brain is an excerpt from the book ‘Hinges and Hinge-Based Catches for Jewelers and Goldsmiths‘and talks about cuff link hinge pins. Cufflinks can work well as a plain three-part hinge. 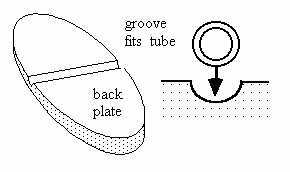 There are some basics to the construction of cufflinks. The cufflink consists of three parts: the front decorative part you see in use (remember that if there is a pattern to them, they should normally be a mirror image of each other-there is a right and a left; I had a bad experience once when I first made a cufflink and this is now etched in my mind), the vertical shaft that goes through the cufflink holes in the shirt sleeves, and the back part which must swivel so that it folds flat against the vertical shaft during insertion through the sleeve, and then folds back to a “T” to lock the cufflink in place. 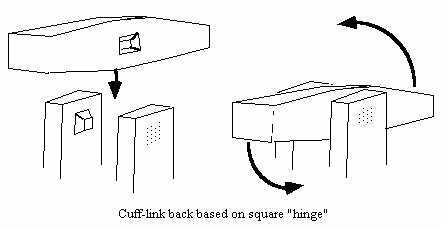 In a plain hinged cufflink back you need to angle the vertical shaft so that the shirt sleeve springing outwards keeps the back part in place and prevents accidental loss of the cufflink. Note that you should groove the swiveling back somewhat to inset the hinge so as to have a stronger join, and to allow the back plate to fold flat against the side of the upright sheet. It is important that the groove is even and runs at a true right angle across the swiveling back plate (unless you want it at a different angle for design reasons). While one can have a perfectly functional cufflink using an ordinary three-part hinge, it is pleasant with a cufflink if there’s a certain “snap” to the back part that retains the cufflink in place in the sleeve. A slight “locking” of this part helps keep the cufflink in place and means that you don’t need the angle to the vertical part as you do with the plain hinged cufflink back just described. There are various ways of obtaining this “snap.” I recommend purchasing cufflinks at flea markets and garage sales-you can usually find orphaned ones, and they’re quite cheap-and having a look at the backs. There are literally dozens of variations in how this “snap” is produced. In the following generic description, we have a tube, and inside this tube are two strips of springy material which are locked in place at each end of the tube. They can be spread apart at the center. The hinge pin that is riveted in place in the upright struts of the cufflink back is made out of square wire. The square hinge pin is inserted through the uprights and the tube, which pushes apart the two springy strips inside it, and the hinge pin is then riveted into the outer struts of the cufflink back finding. Because we have these two springy strips around the square hinge pin inside the tube, the tube will “snap” to two positions at ninety degrees to each other. Usually the ends of such a tube are rounded. No heat can be used in the assembly procedure so as not to temper or anneal the springy material used for the strips. There are a numerous variations of cufflink backs around; most of them snap into ninety degree positions. Another version, which is a relative of the “ball hinge” that is described elsewhere in the Hinges book, has a solid, thick, swiveling, wire cufflink back. It has a square, slightly tapered dent on each side, usually punched in with a strong blow with a suitable square-ended punch. The indentations should be about 1 mm or more deep. The outer arms attached to the cufflink need to be very rigid and strong. At their top ends are square protrusions which can be made by stamping or soldering a square wire through the upright and filing to a slightly tapered block on the insides of the arms. The swiveling back snaps into place at ninety degree positions. 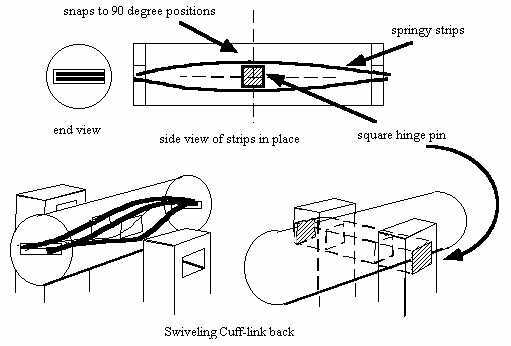 This version requires very stiff, rigid uprights on each side of the cufflink back because it is their flexing and inwards pressure that provides the snap-and they should be designed to last, not to get weak and lose their snap with time. Material choice, cross-section and thickness all play a role in increased structural strength. If the tension on the back is strong enough it is really hard to remove the swiveling back.